Sometimes feelings and thoughts can overwhelm us. We might feel totally consumed by an emotion. The way we describe and give an account of these thoughts and emotions are important. However language is imprecise and doesn’t always do justice to the way we think or feel. In this post I offer a simple technique (that I use in my coaching practice) that may help when we feel encompassed by our thoughts and feelings. It’s based on appealing to the different parts of you. It won’t effect a miracle but it may help to usher in a little hope. In times of stress we think in terms of absolutes. In the classic ‘fight or flight’ survival mode we draw on a limited range of options. If it feels like an emergency we don’t have time to consider all options. By contrast when we are more relaxed we are able to access a broader range of cognitions. This is the essence of Barbara Frederickson’s Broaden and Build theory of positive emotions. In everyday life we speak about ‘taking a deep breath’ before tackling a challenging task. This is the basis of meditations and mindfulness techniques that abound and something I discuss in greater depth in my book Unlock Your Confidence. However, I am concerned with linguistic techniques here. One technique I use with my coaching clients, I borrowed from the theory and practice of focusing, initially created by Eugene Gendlin (and developed by Ann Weiser Cornell – see link below for her book). It’s a form of body-mind therapy that has the individual look inwards to listen to the messages the body gives us. Through the process, people describe the feeling and basically free associate. Part of the process involves naming the part of the body from which the feeling appears to emanate and use the phrase ‘part of me’. So instead of ‘I’m angry’, you would say ‘part of me is angry’. This seems an accurate representation of what we often do when experiencing mixed emotions, especially in relation to relationships with loved ones. Yes we love them but part of us is sometimes infuriated by them. Once you have partitioned the feeling, it immediately invites you to consider the part or parts of you that are not feeling a particular way. In coaching sessions it helps the client consider their issues from a broader range of internal perspectives. Invariably the dialogue follows the pattern ‘You know, yes part of my is angry and rightly so and secretly part of me is relieved or delighted’ and so on. Using ‘part of me’ acknowledges that we are multi-faceted beings and that cannot be reduced to black and white, either-or states. It doesn’t deny the feeling. It acknowledges it in a way that allows other aspects of your experience to have a voice too. It helps to provide a useful platform from which you can move forward. Together with other solution-focused principles it can help break the stronghold of overwhelm. As with any technique, it becomes more effective if you make it a habit, not use it when you need it. It’s a way in which our language shape our thoughts and build our confidence (and esteem) by revealing all aspects of ourselves. How Dare I Speak To Myself Like That! 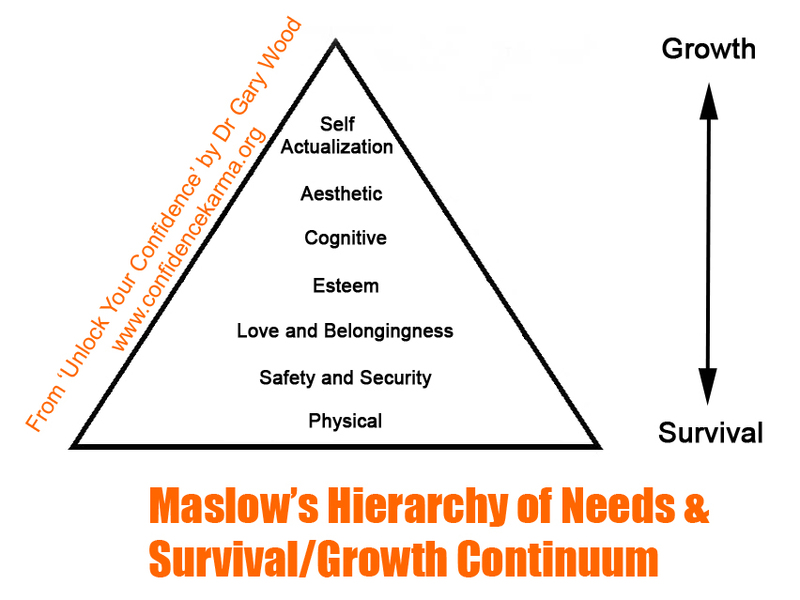 Dr Gary Wood is a social psychologist and life coach. He is author of Unlock Your Confidence which is based on his confidence-building workshops. Gary is based in Birmingham and Edinburgh where he runs his own training and coaching practice and research consultancy. He also offers coaching through Skype. Contact Gary to see how his solution focused (life) coaching approach would benefit you or your organization. Facing up to a new challenge can be overwhelming especially when it seems like totally unchartered territory. Sometimes we doubt ourselves and overlook our past experiences and transferable skills. This leads to a dip in self-confidence. However, often, the only difference between a new challenge and an old challenge is perception. If we perceive something as novel then we might assume that it needs a novel approach whereas what it needs is an application of what we already know. We tend to process information by making connections and create scripts or templates that help us to cut down on the amount of novel information we need to process. It’s a form of cognitive economy. When faced with a problem or a challenge, we don’t start with a blank slate. We attempt to fit new experiences into old scripts. However when under stress we often don’t make important connections with our life experiences. This means that self-doubt overshadows self-assurance. We make sense of the world through out attitudes. By changing our attitude we gain a different perspective. This is at the heart of my approach to (life) coaching. My first foray into coaching was as a teaching fellow at my first university job. My open door policy meant that students often dropped in for a chat. Often conversations were about feeling overwhelmed by the pressures of studying. My job was to work out whether I could help or whether I needed to refer the students on. Often, a chat was enough. I adopted this approach long before I had any formal coaching training and I still use the approach today. It is based on four principles: relax, consider choice, evaluate past experiences, and goal-setting. Relax. Stress has the effect of reducing our options. It throws us into survival mode where the main choices are fight or flight. However this means that other important options and connections can get overlooked. By taking a few long, slow deep breaths we short-circuit the stress response so that we are able to explore a range of responses. This is known as the Broaden and Build approach to personal development. Consider choices. Sometimes challenges seem to offer no choice. We feel forced or pressured with no control over our circumstances. I’ve lost count in my own life when I faced challenges that seemed too overwhelming that I wanted to give up. This is especially true of just about any course or path of study I have undertaken. However, this is perfectly normal. It acts like a safety valve to know that giving up is an option. The first time I used this technique was with a student who arrived at my office door quite distraught. She said that she couldn’t cope with the pressure and just wanted to go down to the coach station, get on a bus and get away from it. I took a risk and asked ‘where would you go?’ This took her aback and she replied ‘I don’t know. Blackpool? Anywhere’. I simply pointed out that it was an option. She could not bother with forthcoming exam and just go to Blackpool (an English seaside town) instead. She then started to ask questions about her future to which I replied ‘Well, you’re going to have to come up with some different plans, it’s up to you’. It was then that she realised that she was choosing to put herself through the ‘ordeal’ of examinations. It wasn’t long before she decided she needed to ‘take her leave’ (but not to Blackpool). She said ‘I can’t hang around all day chatting, I’ve got an exam to revise for’. Realising that it was a choice altered her perception of the challenge. Past successes – Make a list of occasions where you felt overwhelmed in the past and how you managed to get through it. How did you do it? What skills or personal qualities did you use? This will help you to put the new challenge into context. Start with a few long slow deep breaths and get as much down on paper as you can. Take time to add to the list. In my coaching I often follow up a question with ‘anything else?’ I’ll do this several times. This prompt invariably inspires more thoughts and insights. Sometimes during a coaching session a client will think of something else they have forgotten. It’s also true that insights often occur right at the end of a session. Reviewing past successes and skills is a key way to boost self-efficacy, our sense that we are effective agents in the world and not passive victims. Goal-setting. It’s a core principle of goal-setting to break bigger goals into smaller milestones. A longer term goal comprises a series of shorter term goals. There’s no such thing as a insignificant first step. Simply by making a start you alter your perception of a goal. Once you have tackled the first step, the second step becomes clearer. Also, sometimes chipping away at a problem from a few different angles can help to highlight the ‘vulnerabilities’ of a seemingly impenetrable challenge. Making a start before you can see all the way ahead begins to create a path. These four strategies are key to coping with challenges and building confidence, self-efficacy and esteem. Together they form a solution-focused, skills-oriented approach that has the effect of changing attitudes and therefore altering perceptions.It is through this different set of lenses that we are able to access our core strengths, transferable skills and personal experiences. For further information see Unlock Your Confidence by Dr Gary Wood. If you found this blog post useful please share it with others using the buttons below. If I Don’t Try Then I Can’t Fail – Putting Your Goals on Hold?